Stainless Steel has increasingly grown as a popular metal choice for jewelry. Stainless Steel is much thicker and will not tarnish. Made without nickel, this metal type is popular among those who may have metal allergies. ★Remove your Jewelry when sleeping, exercising, or doing other physically strenuous activities, as prolonged contact with sweat will cause the plating to wear away. ★Avoid contact with perfumes, body oils, and other chemicals, including household cleaners. Never use chemical jewelry cleaners as these will do more harm than good. ★For light cleaning, gently polish with a soft, lint-free cloth to avoid scratching. ★Store your beloved jewelry in a cool dry place. Handstamped stainless steel Expandable Charm Bracelet, hypoallergenic, 100% lead-free and nickel free. The bracelet is adjustable...perfect to fit most wrists. Specification: Material: stainless steel, crystal,alloy; bangle diameter: 2.4"; disc charm diameter: 0.86". Inscription:The Love between a Grandmother and Grandson is Forever. 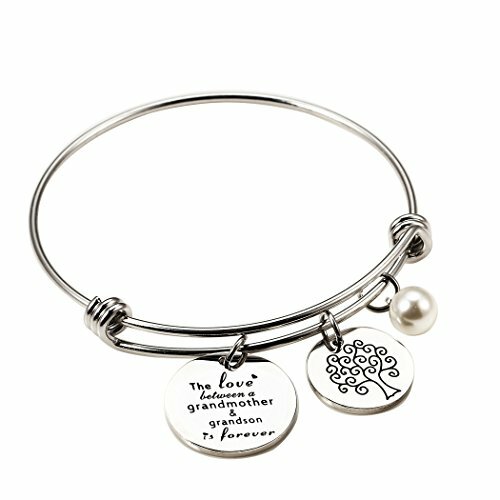 These bracelets are perfect gift for GRANDMOTHER, show how much you love Her. When you order your Jewelry piece today, you're protected by a 30 day, no-questions asked, 100% money back guarantee. If you have any questions about this product by Meibai, contact us by completing and submitting the form below. If you are looking for a specif part number, please include it with your message.